People’s fascination with and fear about the potential of robots makes touting the technology an easy way for companies to grab headlines and burnish their innovation credentials. Sometimes, however, ideas have progressed little further than a concept artist’s brush, while in aerospace the use of robots is much less widespread than many might think for such a high-tech sector. Robots have been used on automobile production lines for decades, but the almost total reliance on handwork in aircraft assembly continued until just a few years ago, when robots began riveting sections of Boeing 777 fuselages together. Such repetitive tasks are ideal for robots, but it was only last year that Airbus automated hole-drilling for A320 sections at its Hamburg assembly facility, and even now humans still perform most of the work on aircraft production lines. Meanwhile, robots have even less penetration in the aftermarket. “Robotics used in, say, the automotive industry—building a consumer product—have many different characteristics to the demands of building a large complex aircraft,” says Patrick Vigie, Airbus’ Head of Manufacturing Technologies. This robot tests cockpit controls and displays by measuring forces that occur when switches are activated. As Vigie notes, there are good reasons for the slower adoption of robotics, chief among them aviation’s rigorous safety standards and the lower volumes it produces compared with mass-production industries such as motor vehicles. However, as image-recognition, actuator and software technologies improve, robotic performance of certain tasks can be better than that of humans, while the unprecedented production ramp-ups of the main aircraft manufacturers are further strengthening the business case for robots. “The use of robotics in the industrial system paves the way for a ‘clean floor’ environment: less clutter and more autonomous working to maximize the use of space, which in turn helps drive improvements in efficiency and quality, while maintaining the highest, no-compromises safety standards,” says Vigie. Maintenance providers must adhere to the same high standards, and for them the adoption of robots is complicated further still by the huge range of inspection, testing, and repair tasks required of aircraft and engine support. Accordingly, the industry is set to rely on the flexibility of human workers for the foreseeable future, but this has not stopped several MRO providers and third-party companies from developing automated solutions for specific tasks. 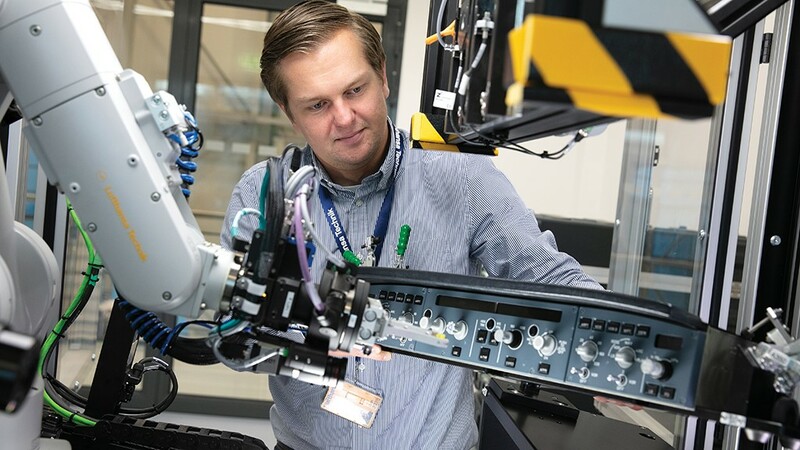 Given Germany’s status as the third most automated country in the world for manufacturing, it is no surprise that Lufthansa Technik has taken the lead in developing robots for MRO. Spearheading its efforts is AutoInspect, a robot designed to perform digital crack inspections on engine components with the help of high-end sensors, a task previously done by hand with dye penetrants. AutoInspect is now operating on the shop floor for certain engine parts, but the challenges inherent in developing such technologies are illustrated by its sister project, AutoRepair, a robot intended to complete the automation chain by repairing combustor components after they have been robotically inspected. There were plans for the pair of technologies to be in operation by the middle of 2018, but that goal has now shifted “to start production in 2019 at the earliest, depending on when we get the approvals for the first parts,” says Gerrit Rexhausen, Program Manager of Corporate Innovation at Lufthansa Technik. 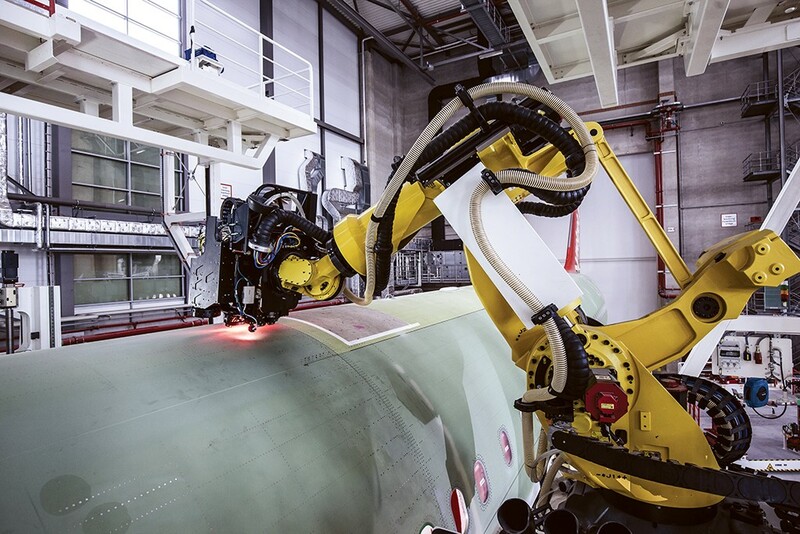 Airbus uses two seven-axis robots on the new fourth A320 line in Hamburg to drill 80% of the holes in the upper side of the sections, improving ergonomics for workers. Rexhausen points out that although industrial and other robots have become much cheaper in the last 10 years, there are no off-the-shelf technologies that an MRO provider can buy and immediately put into operation. One reason is that different robotics manufacturers use different programming languages, which means that Lufthansa Technik must develop its own middleware software to communicate between its own systems and a robot. “We need a robot that can connect within our complete process environment, including the IT, and can implement all the sensors we need such as optical sensors on the robot arm. . . . Otherwise, we won’t achieve the maximum efficiency by implementing the robot,” says Rexhausen. Despite these difficulties, Lufthansa Technik is pursuing automated solutions for a variety of jobs. After AutoInspect, its next most developed robot is for testing cockpit controls and displays. The robot has integrated sensors to measure the forces that occur when switches are activated. In addition, it is equipped with several industrial cameras with which it captures all display instruments and any outside damage. With another camera, it measures the brightness of all displays from various angles. The Robot Controlled Cockpit Electronics Testing (RoCCET) project is almost ready for implementation on the shop floor, says Rexhausen. Another advanced project is an automated scarfing system called CAIRE. After a damaged piece of carbon fiber is cut away, scarfing prepares the edges of the hole for a patch by sanding them into a taper. The angle of the taper is determined by the load on the structure being repaired, and Lufthansa’s mobile robot can conduct on-wing, high-precision scarfs on up to 1 m2 (10.7 ft.2) of carbon-fiber-reinforced plastic. CAIRE starts with a scan of a damaged component, from which a computer can direct a robotic milling machine. Later, cut-to-size panels are bonded with the primary structure and then cured as required on molds generated by rapid prototyping using the already scanned data and computer calculations. At an earlier stage, meanwhile, a collaborative robot (cobot) is intended to independently check the fill level of large batteries and, if necessary, remove vents and seals to refill distilled water in the battery cells. Designed to work alongside a mechanic, this cobot is currently in development, and Lufthansa Technik hopes to have it certified soon. MRO Drone’s RAPID system can inspect specific structures, for example, after reports of a bird strike. Another area of crossover is the burgeoning market for lightweight, camera-equipped drones that can be programmed to operate autonomously. EasyJet and Thomas Cook Airlines have tried out an autonomous drone that was originally developed for nuclear reactor inspections. It can perform a full exterior inspection of a narrowbody in 30 min. and of a widebody in 1 hr. 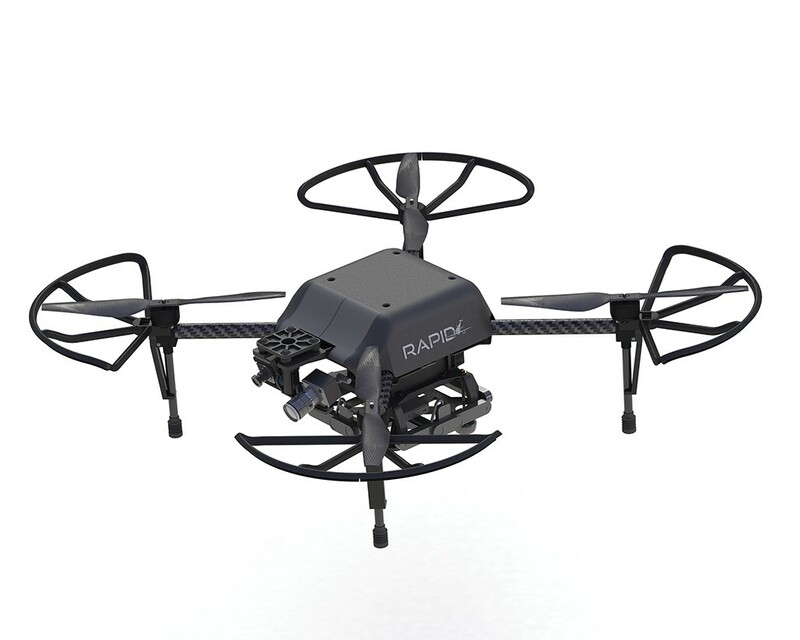 Developed by joint venture MRO Drone, the RAPID (Remote Automated Plane Inspection and Dissemination) system can also inspect specific structures, for instance after reports of a bird strike. It is an evolution of the RISER drone originally developed by Blue Bear, one half of MRO Drone (the other half is Output 42). Gavin Goudie, Operations Director for Blue Bear, believes airline interest in the system has increased as customers have become increasingly familiar with drone technologies. “We have recently supplied our first system to a USA-based customer,” he says. “Further development integration of the sensor payloads, including non-optical and potentially NDT [non-destructive testing] tools are key focus areas for drone-based inspection technology, and this—coupled with machine learning and AI [artificial intelligence] techniques—will significantly aid the automation of such assets,” he adds. Airbus has also demonstrated an inspection drone, but a non-flying robotic inspection option also exists in the form of a crawler robot developed by New Zealand-based Invert Robotics. As with the RAPID drone, Invert’s system was initially developed for a different task—milk-tank crack inspections for the dairy industry—but its potential for aerospace was quickly spotted. “The robot and its associated camera are undergoing assessment by the major OEMs as an alternative or approved means of compliance for GVI (general visual)/DVI (detailed visual) and SDI (special detailed) inspections,” says John Blair, Invert’s executive director for aviation. Although the crawler’s advertised narrowbody inspection time is roughly twice that of a flying drone’s, Blair says a surface-mounted inspection technology has several advantages, including camera stability, battery life, permission to operate outside the hangar and greater functionality. “Drones do not have the potential to offer NDT functions that require consistent or regular contact with the surface of the aircraft,” says Blair. While drone developers envisage adding testing capabilities to their systems, some companies are planning even more radical autonomous solutions. Chief among them is Rolls-Royce, which has released concept art for a “snake” robot that would navigate the inside of an engine, releasing 1-cm-long “swarm” robots to send back imagery. Initially, these would be used for inspections, but Rolls-Royce also wants the robots to perform testing and even repair work eventually. It is working on the miniaturization of coating technologies to achieve this. Kell says the ultimate goal is to miniaturize an overhaul facility and deploy it on the end of a snake robot. However, despite progress that has seen the first robots deployed in a training engine, he estimates it will be some time before the first tiny robots became operational. In the nearer term, the industry might benefit from better inventory and tooling management by using robots of the type pioneered by Amazon in its warehouses. Airbus, for example, is researching an autonomous mobile robot to deliver tooling and components around its wing-making facility in Broughton, England. Its chosen vehicle is the MiR200 robot from Danish company Mobile Industrial Robots. With a payload of 200 kg (440 lb.) and top speed of 4 kph. (2.5 mph), the robot uses laser scanners to navigate its environment autonomously, while lamps and beacons indicate its status and intended direction to engineers working nearby. The wide array of autonomous technologies described here may cause workers to fear for their jobs. If robots can perform quicker inspections, more reliable testing and more accurate drilling and fastening, what tasks will be left for humans? The answer is most of them, says Rexhausen, who believes not only will humans still perform most maintenance activities a decade from now but also that robotics will only drive small changes in the MRO sector. “Other technologies, like analytics and AI, will have more influence on our MRO business and on the way workers will work in the future,” he adds. He also points out that not a single worker has lost a job to a robot at Lufthansa Technik, and that its workers’ council is onboard with all the robotics projects that the MRO provider is pursuing. A big reason for this, he says, is that the goal of such projects is to free up workers from boring, repetitive tasks and allow them to focus on jobs that require more flexibility and innovation. Robots also can improve worker health by taking on tasks in cramped environments and those that can lead to repetitive strain. Boeing reported that more than half of injuries on its 777 program occurred from installing the 60,000 rivets that keep sections together, a task that has been taken over by its Fuselage Automated Upright Build robots. “Robotization brings improved efficiencies, quality and lead times in production, as well as improved ergonomics for the workforce, especially for tasks that have to be carried out in small, uncomfortable places, involving lots of repetitive actions,” notes Vigie at Airbus. Cobots that work alongside humans are another reason why the latter might embrace rather than fear further automization. Airbus’ factory-floor robot is one example that could be scaled up or down. For instance, engineers might have small, voice-recognition-equipped robots nearby to hand them tools, letting them keep their eyes on the job. If aircraft maintenance workers need more assurance about job security as automation advances, they need only look to South Korea, Singapore, and Germany. Respectively, these are the three most automated countries by the proportion of robots in manufacturing, but they also have some of the lowest unemployment rates of any of the industrialized countries. Robotics, it seems, has a bright—if limited—future in MRO, for employers and employees alike. Written by: Alex Derber, Writer for MRO-Network.com.